319 Dumbarton Road, Glasgow. G60 5JQ.Tel: 01389872821. This was the site of the old Criterion Bar up to the 1990s when it was refurbished and renamed The Ettrick. There were two other Ettrick Bars in Partick, a large establishment across the road at the corner of Dumbarton Road and Crawford Street the smaller premises were located in Castlebank Street. There's been a pub on this site since the 1820s, it was originally called the Gun, when Hugh Aitken took over the premises he renamed it The Criterion, the original pub was demolished and a new tenement and pub on the ground floor was erected on the site. In 1913 William Craib took over the business, William started his career in 1905 and was granted a public house licence for premises in Taylor Street, Townhead. He was residing then at 47 Rottenrow not far from his new pub. In 1911 he took over another pub at 770 Dumbarton Road, Dalmuir, before taking over the Criterion Bar. During the First World War William fought in the Army, he was one of the lucky ones to return and carried on in the licensed trade. During his period in the forces his uncle took control of the business. On his return he went on to be an agent for Arthur Booth Ltd, wholesale wine and spirit merchants. In 1926 he took over another pub at 21 Westmuir Street, in the east end of the city. Before the out-break of the Second World War his firm was now trading as William Craib & Company, then having offices in St.Vincent Street. 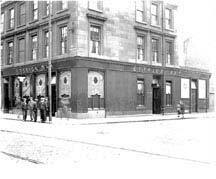 The old Ettrick Bar at the corner of Crawford Street and Dumbarton Road. 1930s. This old pub was owned by Daniel McMenemy in 1899, he also owned a pub at 267 South Wellington Street at the corner of Cumberland Street, this old pub later became known as E Smyth. From 1920 till after WW2 Thomas Hogg was licence. 1957 Mr Henry S Lymburn acquired the licence. From 1961 till the 1970s James Campbell Corrance was landlord here, he also owned ther Possil Bar, Possil Road. The Ettrick Bar, 519 Dumbarton Road, after reconstruction in 1956. Henry S Lymburn had the premises reconstructed as part of Glasgow's growing number of Brighter Bars in the city. The reconstruction consisted of both interior and exterior. The use of Italian marble gave the frontage a brand new look. The interior had a main bar and a new cocktail bar, the main bar had a mural depicting shipping scenes. The manager of the pub was Mr T Blue.